If you’ve followed this site for any length of time, you already know that my backyard deck is “deck-orated” with tree branches attached to the rails with the help of some bungee cords I confiscated from hubby’s workshop. These branches are perfect bird perches and make for some lovely photo opportunities. This past weekend, I decided to prop up one of the limbs vertically. 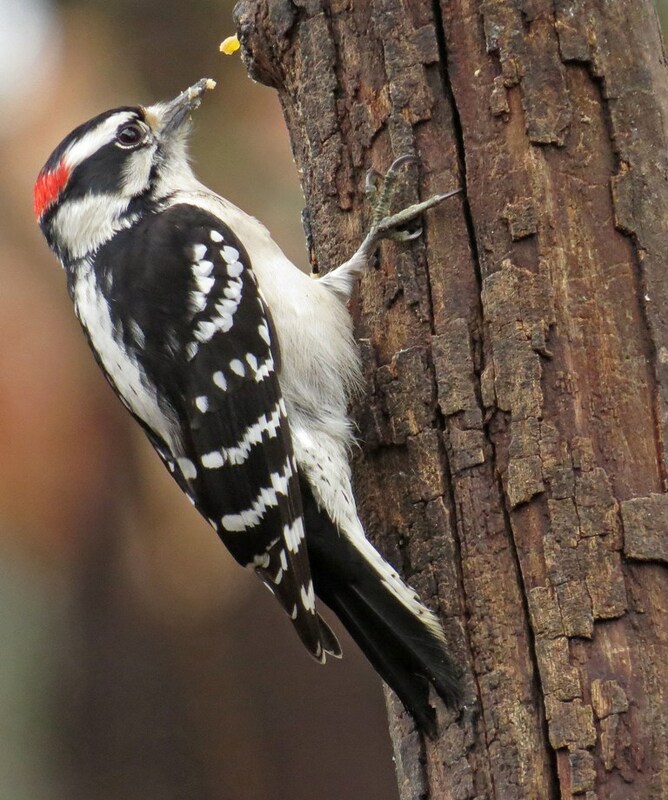 In no time at all, the Woodpeckers had discovered this new landing spot and were pecking away at the bark butter smeared on the backside. 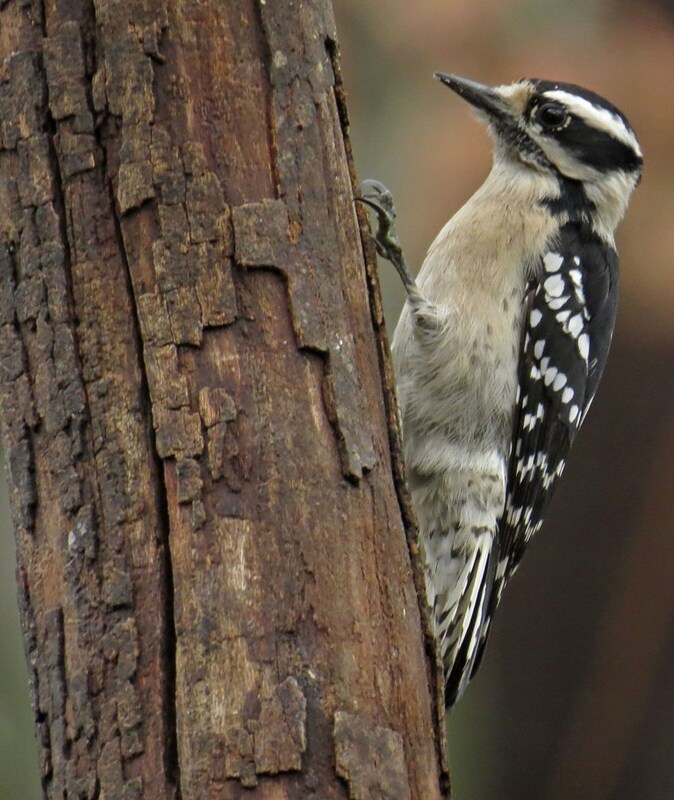 It’s been hard to get pictures amidst the constant rain, but here are two Downy’s that showed up. I love how he can get such a good grip with those sharp claws and how fluffy his belly feathers are. 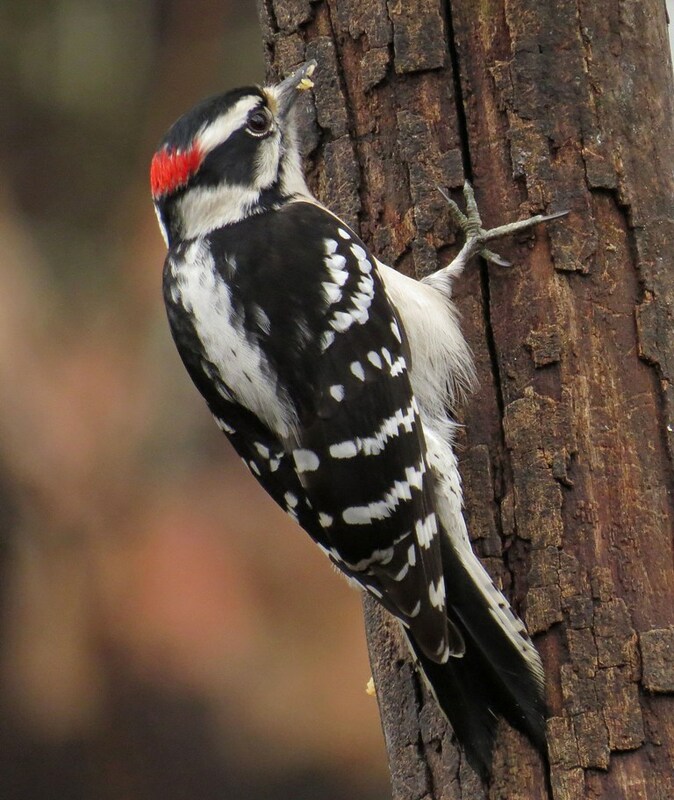 This entry was posted in Backyard Birds and tagged backyard birds, bird feeding, birds, Downy Woodpecker, georgia, photography, writing. Bookmark the permalink. Handsome fellow in formal dress. Butter, you say? How do you do that? Plain regular butter? I know they like suet blocks, but the squirrels do too. Kathy, have you ever tried making your own suet? I could share Hub’s recipe. The birds go wild for it! Love your amazing closeups (as always)! Might have to get that from you! I tend to buy the Bark Butter to support the local bird store, but trying something new could be fun!